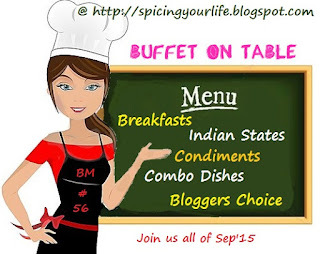 There is no standard Indian breakfast menu as almost each state in India has different specialties. 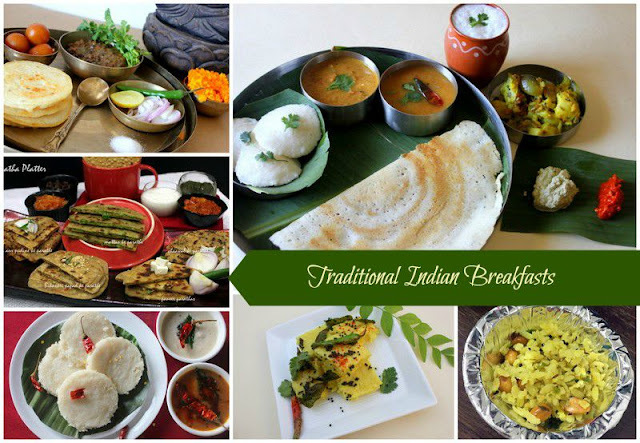 However, one can broadly classify breakfast varieties in India into 2 types; North Indian and South Indian. I did not want to skip the East and West zones , so for today I have chosen to cook from all four regions. If one goes up North we find a variety of Parathas , Chole Bhature / kulche , Bedmi / Poori Sabzi. The Parathas have numerous stuffings and are normally served with curd, pickle, chutneys. The Parathas are rich , fried in ghee and the hot favorite is Aaloo paratha. Down South we have idlis, dosas, uttapams, Appams. All served with Sambar , stews a variety of chutneys . We even get to see some Poori Bhaji . West has Theplas, khakras, Dhoklas , khandvi, khaman. East has Ghughni, eggs and rice preparations. These are the traditional breakfast, though each state has something special, it is amazing how India is a land of diversity in every field. We can’t miss the Poha Jalebi from Madhya Pradesh. Puttu Kadla curry from Kerala and many many more options. You go to a nice luxury hotel the spread is really wide. They make sure that the spread has cuisine to satisfy people coming in from all regions. A spread where they gave a variety of fresh fruits, dry fruits , cereals, milk juices along with the main course which could even have international breakfast dishes. Breakfast which means breaking your midnight fast, your first meal of the day should always be nutritious and healthy to keep you going throughout the day. Here is the breakfast that I have cooked for Buffet on Table. I would have loved to give you all a even more elaborate Five Star Buffet, but I needed people to eat, so had to restrict to these dishes only. Perhaps will do a Buffet Breakfast sometime later. Beautiful spread from all four regions of the country. Love the cute banana leaf cutouts for serving the breakfast. Amazing spread of breakfast across the country.You have done it so beautifully. You never failed to amaze us with your beautiful thalis and here is again an example Vaishali, love all your posts and your enthu to create all these dishes to serve us virtually. OMG Vaishali, even I didn't know you had such packed day for the last one!..you have kept the best for the last no doubt!..Yes I enjoyed each one of your posts and this one takes the cake!..wow..what a stupendous effort in putting all these together!.. What you were planning for a more elaborate breakfast Vaishali. This itself is very elaborate for my standards. If I ever come to your house to eat, I'll definitely make sure to fast for 2~3 days, this way I will be able to enjoy everything you feed me 🙂 🙂 What a lovely spread and love the idea of making breakfast dishes from the 4 corners of India. Hats off to you for coming with the breakfasts from all regions!